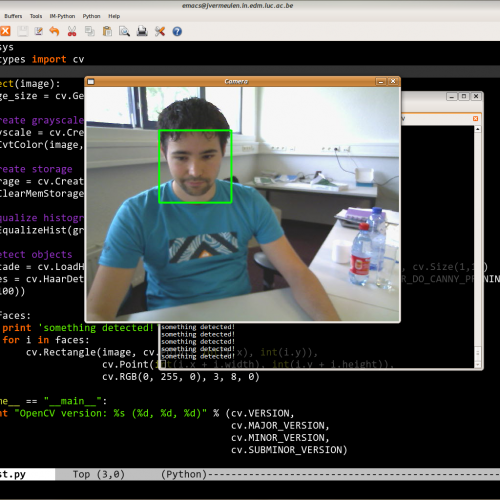 Facade is a small program that tries to determine a user's presence using a webcam and face detection algorithms. If no face has been detected for a certain period (e.g. 10 seconds), it assumes the user is away from his desk (or at least not paying attention to the screen). Facade has a custom status icon that pops up notification bubbles whenever a presence change occurs. It also sets the user's IM status by connecting to Pidgin's D-Bus interface. The software is licensed under the GNU GPL. The latest code can be checked out on Github. * Most likely already installed on your GNU/Linux distribution. There is currently minimal support for Windows through the simple_winclient.py script, which just prints out the detected status. I would like to thank Gary Bishop and Minh-Tri Pham for CVtypes, an easy-to-use ctypes-based wrapper for OpenCV.